Perichoresis is the tenth studio album by Secret Chiefs 3, the solo project of guitarist Trey Spruance, formerly of Mr. Bungle and Faith No More. The project has a highly diverse sound, largely due to the fact that the name Secret Chiefs 3 is meant as an umbrella term for seven “satellite bands” each of which represent a different facet of Spruance’s diverse interests, be they musical, mathematical or philosophical, which often gives their albums the feeling of being a compilation. The lineup, as well as the project, often changes from track to track (Spruance being the sole constant member). Perichoresis represents a departure from this pattern, as it is one of only two albums in the band’s discography to feature material entirely from one of the satellite projects. 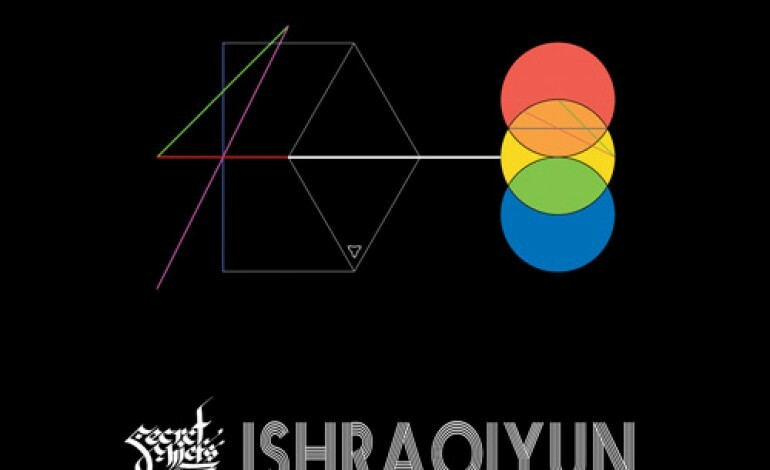 This project, Ishraqiyun, which represents the “neo-pathogorean electro-folk side” of Secret Chiefs 3 is every bit as esoteric as the description would suggest, juxtaposing middle eastern melodies and instrumentation, microtonal tuning systems, ratio based mathematical rhythms, and electronic synthesizer noises. The scope of the project is ambitious, and results are somewhat mixed. Much of the record’s strength comes from the electronic aspects of the project, which grow more present as the album progresses, but unfortunately are mostly absent from the first two tracks. Named “The 15” and “The 7” these initial tracks are based on odd meter Middle Eastern motifs that are continually repeated and built upon dynamically. “The 15” relies on a fairly basic crescendo and decrescendo to create the arc of the composition, supported at its peak by splashy snare and crash cymbal hits that come off as vaguely circus-like, and its melody grows tiresome early on. The album gets substantially more interesting with the track “Base Phive Futur Cossacks,” which makes heavy use of the electronic sounds to positive effect. The composition of the song is based around contrasting a western equal temperament and Middle Eastern microtonal melodic motif. The equal temperament melody feels like a breath of fresh air, and while it leaves one wishing it lasted longer the liberally applied modular and electronic sounds add some pleasant weirdness that makes the track well worth the listen. The album hits its best stride with the last two tracks. “Perichoresis”, a sprawling 17-minute epic for which the album is named, is probably the most compelling representation of the album’s mathematical rhythmic concepts, making use of gradual shifting polyrhythms to create a heavy, droning ambience. The album then closes out with “Saptarshi” a tune with heavy fusion vibes that feels pleasantly concise in contrast with the lengthy, repetitive nature of most of the compositions. Overall, the record struggles against growing monotonous. The Middle Eastern melodies form the basis of most of the compositions, and they are milked for all they are worth, but unfortunately lack the staying power to support their continual repetition. The album has some interesting moments, usually electronic sounds, western melodies, or the occasional guitar solo such as on “Saptarshi”, but these often only last for a bar or two before plunging back into a dull microtonal section. The album does however have several important redeeming qualities, in the form of the fun quirkiness of “Base Phive Futur Cossacks”, and in the superior composition heard in “Perichoresis” and “Saptarshi”.